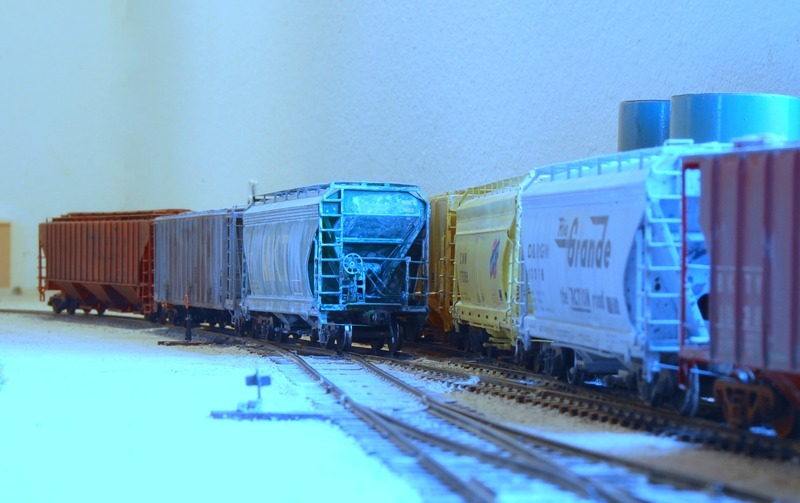 While that structure is (very slowly) taking shape, Let’s check out some LCN RR action! The CR Tangent car weathered my usual way. It was repainted 9-88 so it didn’t need a heavy weathering job. For the PC car, I tried burnt umbra artist oil paint and paint thinner for the first time after reading Lance Mindheim’s blog. I made a wash of the paint and thinner and it worked pretty well. I figured the PC car with a 1970 date needed to be pretty weathered. The wash covers nicely, just takes a day or two to dry. I also deformed the sides of the car with some heat from a big soldering iron. Not very apparent in the photo but the sides do bulge out. I almost got things too hot as the side ladders just started to deform, but the look somewhat bent as real ladders on tons often do. Editor’s note — Have a great Memorial Day and please remember and reflect. Somme American Cemetery, 2013. A World War I American cemetery in eastern France. For more on it click here. I have gotten a few requests wanting some more coverage of B. Smith’s LCN RR. I asked him to photo-document a recent run. 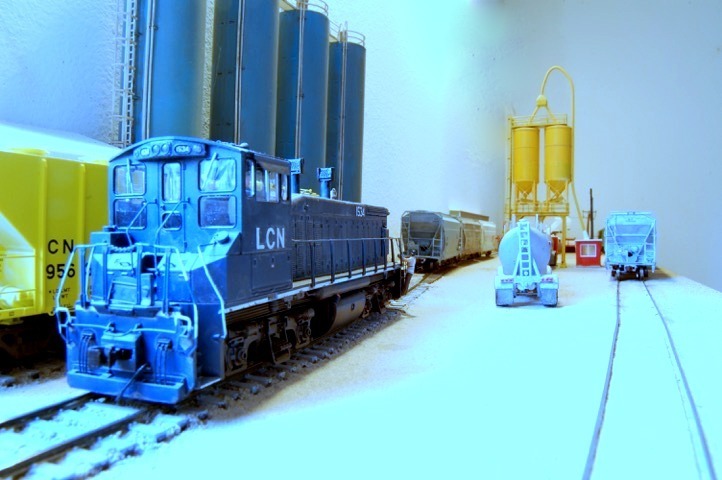 Let’s follow along as the LCN switches Pecos and makes a run during the spring of 1990. First move of the day is to grab the three empty sand cars further down the track. The three empties will be shoved down the other sand unloading track against more empties. 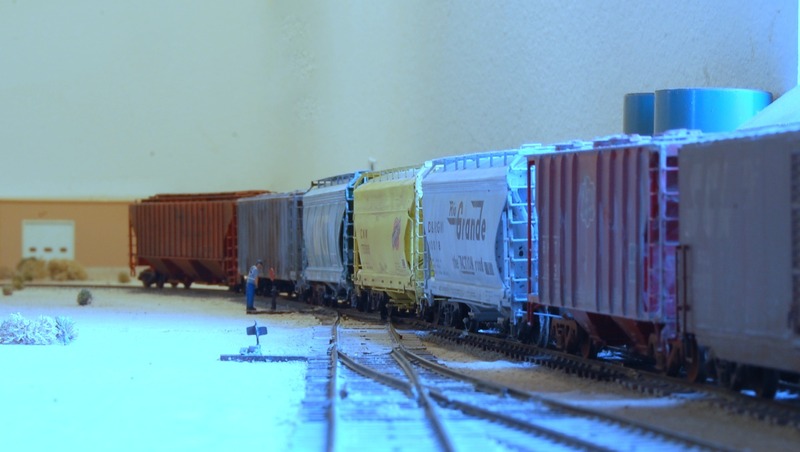 All these are empties except for the MP car, in the center of the consist of course. With all the cars together the train has pulled out clear of the switch. They couple into the empty at the Animal Supplement loading/unloading spot, then couple into the yellow CNW which is still loaded and needs to be shoved back to its unloading spot. Now the loaded MP car can be re-spotted at the unloading chute by the yellow silos. Now the outbound train is together. 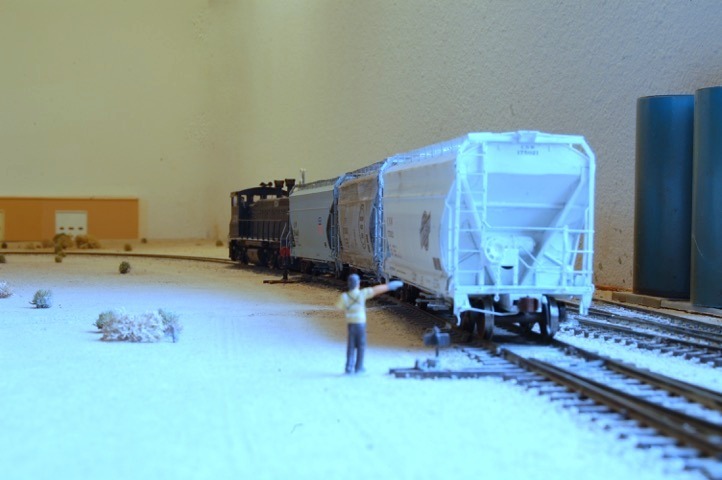 The train pulls ahead so the conductor can perform a brake test before departing Pecos. Because of an unusually heavy train, the crew swapped power for the return trip, now a GP-38. 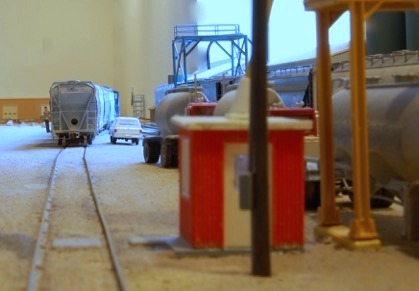 Since the run around track will hold only five or six cars and the spur that Fat Cow Inc., the animal supplement producer, unloads tank cars on is empty, the crew will shove as many cars into that spur as it will hold, in this case five. The train is put back together on the main track, now five cars shorter. The train has pulled ahead with the remaining five sand cars down the main, come back through the side track, and gone into grab that MP car that had to be re-spotted this morning before leaving town. After the cars have been put in the proper order they are shoved to a spot. The box car is shoved in first to near the end of the track next to the one of the two unloading docks. 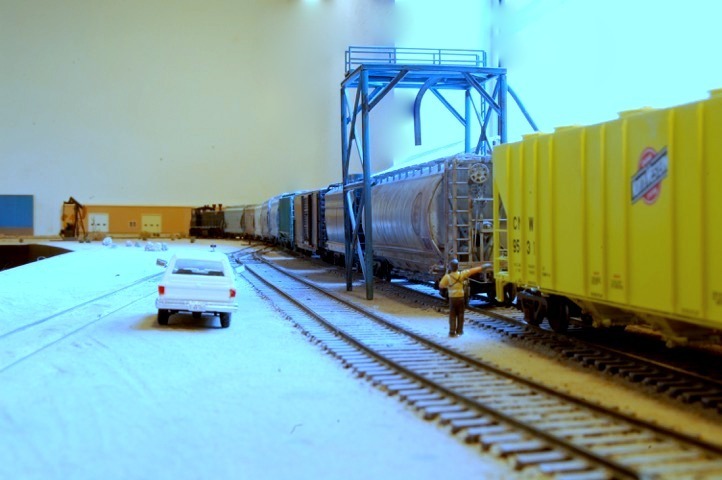 The sand cars are spotted for unloading at the yellow silos and the truck crossings are left clear. The cars for the animal supplement producer have been tagging along on the other end of the locomotive. Always cool to see NP cars in 1990 consists! 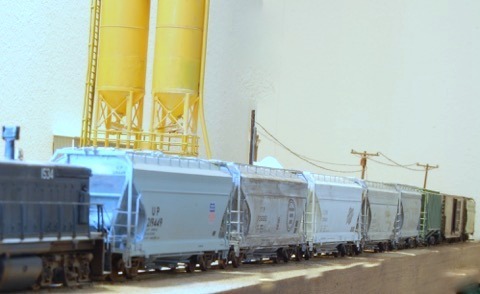 Three sand cars are brought out of the tank car unloading spur and put on top of the animal supplement cars. These are dragged down the main track and run around by the locomotive. 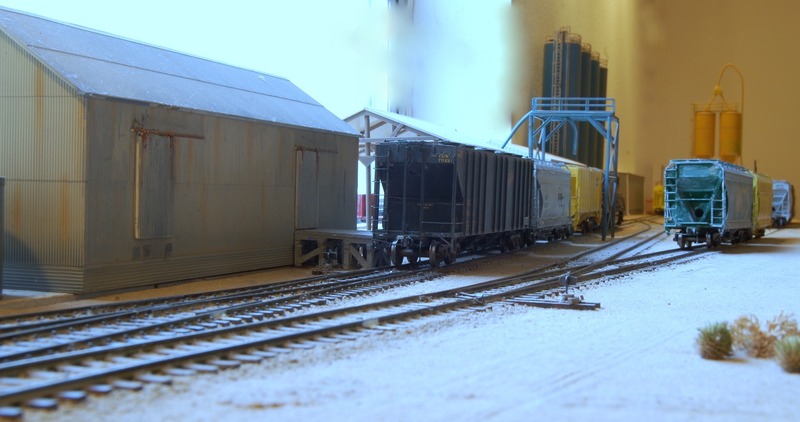 The sand cars are shoved down to their unloading area and the animal supplement cars spotted, the orange DRGW for loading, the grey NP car for unloading. The switching completed for this day, the engine moves ahead next to the two sand cars still on the tank car unloading track. And backs down to the crew vehicle and tied down.